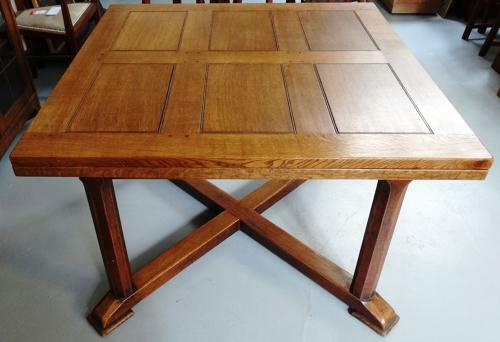 An extremely rare, oak, extending draw-leaf dining table (its matching six chairs, shown in one of the images are available separately or together with this), by the highly regarded Arts and Crafts/Cotswold School cabinet maker from the Lake District, Stanley Webb Davies (1894-1978) of Windermere. The rectangular paneled table top with six square inset panels and two further rectangular panels in the draw leaves. Superb quality construction oozes throughout; with each section individually pegged and the base with chamfered detail to the legs and an X-framed cross stretcher. The table is stamped with the Stanley Webb Davies cartouche/monogramme and dated for 1929. A similar but later dining table was bequeathed by SWD to the V&A Museum and held in their collections. Stanley Webb Davies originally served his apprenticeship with Arthur Romney Green in Hampshire in 1920. In 1923 he set up in Windermere, where he built Gatesbield, his workshop and house where he went on to design and make furniture until 1960. This dining suite originally came from a house in Gatesbield in the same road that Stanley Davies lived. Table 42" long, 29" high, 42" deep; extended 72" long.